The Hyster Fortens 2-3.5 tonne capacity forklift offering has developed over time to support individual application needs and deliver all-round benefits. One key consideration is operator comfort, which can impact productivity, especially during long shifts. Suitable for operations of any size, Hyster Fortens lift trucks have a spacious operator compartment and ergonomic air suspension seat creating a comfortable working environment. A reliable transmission protects lift trucks from any major damage when operating in intense 24/7 applications. The Hyster DuraMatch transmission option on the FT series is electronically controlled and protected and supports the most intense 2-3 shift operations, seven days a week. Good awareness and visibility are essential, particularly in operations with many forklifts, or areas where pedestrians work alongside vehicles. Several features are now available as standard on the Hyster 2-3.5FT series to bring additional support to operators. To help drivers accurately position loads at height, return-to-set tilt is now included when the TouchPoint e-hydraulics option is ordered, and where the DuraMatch transmission is ordered, anti-roll back on ramp, powertrain protection and a standard speed limiter are also included. Whatever the application, Hyster Fortens trucks are designed for maximum productivity, low lifetime costs and extended service intervals. For example, oil immersed brakes are protected from tough, dirty environments, minimising brake maintenance. Hyster Tracker telematics, which can be ordered for factory-fit or installed later via local Hyster distribution partners, can further increase uptime and profitability. Through monitoring the usage of Hyster Fortens lift trucks, businesses can identify the right number of trucks needed to suit the specific application, or better utilise their fleet to maximise productivity. A reliable engine is at the heart of a dependable and productive lift truck. 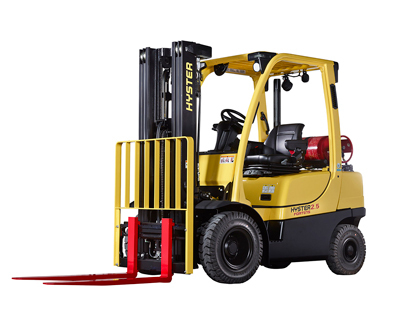 With reliable, powerful engines, Hyster Fortens H2.0-3.5FT models are available that are suitable for indoor and outdoor use, with diesel and LPG options. Proven to lift continuously at capacity in intensive applications, operate on steep gradients, work extreme hours and in dusty environments, these tough trucks are designed to perform consistently in the face of multiple challenges. What’s more, to meet with Stage V emission legislation, the Hyster H2.0-3.5FT series will be available to order with low emission Stage V compliant Kubota or PSI engines. The Hyster 360° product range provides equipment to meet application specific requirements, including a range of attachments carefully matched to the application to help increase efficiency. For instance, we now offer a factory-fit option on multi-pallet handler and rotator attachments for the Fortens to help control quality. The Hyster Special Engineering team also can provide bespoke solutions on the Hyster FT series to meet a myriad of specific handling needs. Leaking hydraulic fluid causes unnecessary downtime for busy and demanding operations, impacting productivity. To enhance reliability, Hyster Fortens trucks feature hassle-free hydraulic systems with leak-free O-ring face seal fittings fitted as standard, and hydraulic power on demand, provided by variable displacement pumps. Warranty terms are often a good indicator of reliability when selecting a forklift truck. The warranty for models in the Hyster H2.0-3.5FT series has recently been extended to two years or 4000 hours. Factory-fit attachments also come with a choice of two-year or 4000-hour warranty. Combined with the other extensive benefits of the H2.0-3.5FT series, this provides a reliable 360° solution to meet the demands of applications.